Having passed by the Sharpie Pen on the store shelves for years, it was a revelation to me when I finally used one for the first time. Its clean, consistent lines seem to improve the way handwriting looks, it barely smears, and Sharpie even managed to make the pen look nice. Because I have a predilection for retractables, I was eager to grab the Sharpie Pen Retractable, and though this version improves upon the original, I’m sorry to say that it didn’t quite meet my high expectations. 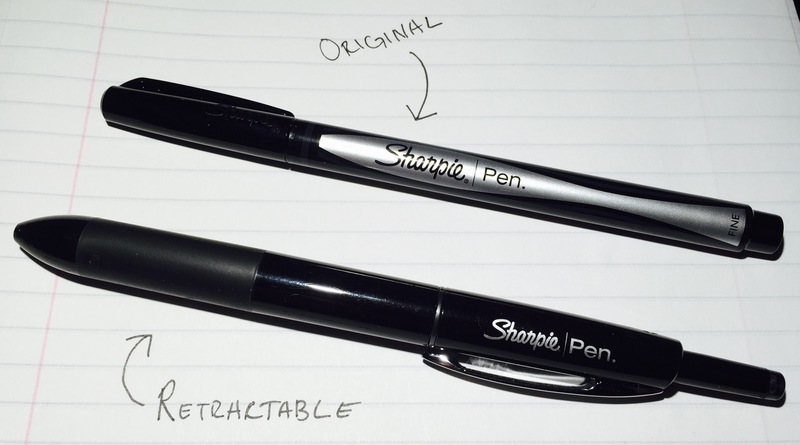 Let’s start with the good: The Sharpie Pen Retractable has the same great writing performance as the original, adding a couple great features. The grip was a good idea – though I never had too much issue handling the original, a grip makes it much easier to write with for longer periods. The thicker design helps too, making the whole pen feel a bit more durable, and the flimsy clip of the original has been replaced with metal. On the other hand, the clicker/knock mechanism is annoyingly long, there’s some slight rattling in the barrel while writing, and, although it’s slightly heavier than the original Sharpie Pen, it still could use a bit of added weight for a good balance. These are all very minor complaints, but at more than twice the cost of the original Sharpie Pen (at all the places I looked), I can’t say that the Retractable is a particularly good value for a non-refillable pen. It might be better to just stick with the original Sharpie Pen. Office Supply Geek cut a Sharpie Pen Retractable open and shows that the ink cartridge is smaller than the original Sharpie Pen. So there’s a good reason to stick with the originals; they last longer. A review by Rhonda Eudaly. She also finds them a bit pricey. 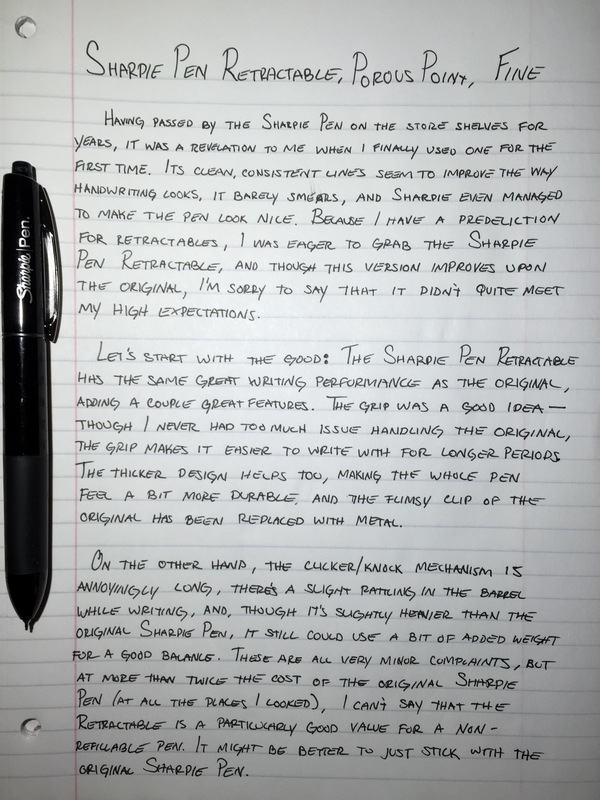 A Penchant For Paper has a review of a slightly older model of the Sharpie Pen Retractable. It looks very similar, and she also commented on the length of the clicker and rattling. Though it didn’t seem to bother her.